Because of the adaptive nature of position sizing, trend-following strategies can generate the positive skewness of their returns, when infrequent large gains compensate overall for frequent small losses. Further, trend-followers can produce the positive convexity of their returns with respect to stock market indices, when large gains are realized during either very bearish or very bullish markets. The positive convexity along with the overall positive performance make trend-following strategies viable diversifiers and alpha generators for both long-only portfolios and alternatives investments. I provide a practical analysis of how the skewness and convexity profiles of trend-followers depend on the trend smoothing parameter differentiating between slow-paced and fast-paced trend-followers. I show how the returns measurement frequency affects the realized convexity of the trend-followers. Finally, I discuss an interesting connection between trend-following and stock momentum strategies and illustrate the benefits of allocation to trend-followers within alternatives portfolio. 1. The skewness and the convexity of strategy returns with respect to the benchmark are the key metrics to assess the risk-profile of quant strategies. Strategies with the significant positive skewness and convexity are expected to generate large gains during market stress periods and, as a result, convex strategies can serve as robust diversifiers. Using benchmark indices on major hedge fund strategies, I show the following. - While long volatility hedge funds produce the positive skewness, they do not produce the positive convexity. 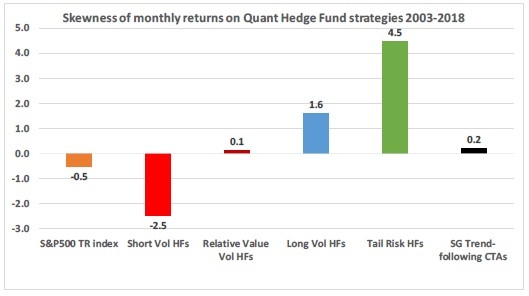 - Tail risk hedge funds can generate significant skewness and convexity, however at the expense of strongly negative overall performance. 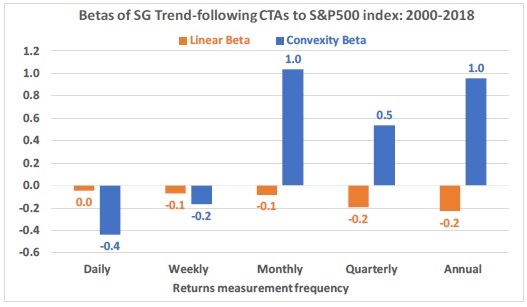 - Trend-following CTAs can produce significant positive convexity similar to the tail risk funds and yet trend-followers can produce positive overall performance delivering alpha over long horizons. 2. Trend-following strategies adapt to changing market condition with the speed of changes proportional to the trend smoothing parameter for the signal generation. As result, when we measure the realized performance of a trend-following strategy, the return measurement frequency should be low relative to the expected rebalancing period of the trend-following strategy. Using the data of SG Trend-following CTAs index, I show that trend-followers are expected to produce both the positive skewness and convexity for monthly, quarterly and annual returns. As a result, trend-following strategies should not be seen as diversifiers for short-term risks measured on the scales less than one month. Overall, I recommend applying quarterly returns for the evaluation of the risk-profile of a trend-following strategy. 3. 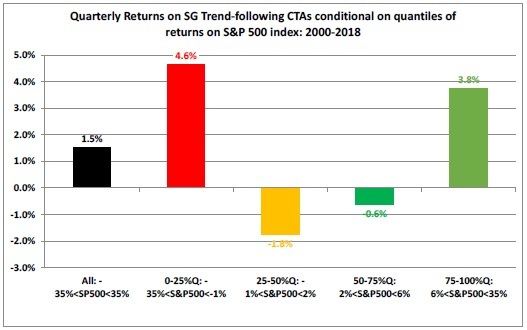 By analyzing quarterly returns on the SG trend-following CTAs index conditional on the quantiles of quarterly returns on the S&P 500 index, I show that trend-following CTAs can serve as diversifiers of the tail risk. On one hand, the trend-followers generate significant positive average returns with positive skewness conditional on negative returns on the S&P 500 index. On the other hand, the trend-followers generate large positive returns, but with insignificant skewness conditional on large positive returns on the S&P 500 index. Conditional on index returns in the middle of the distribution during either range-bound or slow up-drifting markets, the trend-followers generate negative returns yet with significant positive skewness. 4. The nature of trend-followers is to benefit from markets where prices and returns are auto-correlated, which implies the persistence of trends over longer time horizons. I present the evidence that the recent underperformance of trend-followers since 2011 to 2018 could be explained because the lag-1 autocorrelation of monthly and quarterly returns on the S&P 500 index become significantly negative in this sample period. The negative autocorrelation indicates the presence of the mean-reverting regime, even though the overall drift is positive, in which trend-followers are not expected to outperform. I introduce an alternative measure of the autocorrelation that can be applied to test for the presence of autocorrelation in short sample periods. 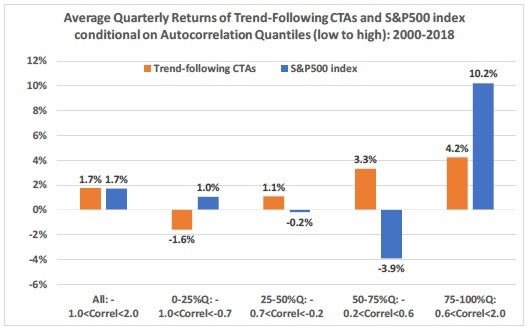 I show that my autocorrelation measure has a strong explanatory power for returns on SG trend-following CTAs index. 5. To quantify the relationship between the trend smoothing parameter, which defines fast-paced and slow-paced trend-followers, and the risk profile of fast-paced and slow-paced trend-followers, I create a quantitative model for a trend-following system parametrized by a parameter of the trend smoothing and by the frequency of portfolio rebalancing. The back-tested performance from my model has a significant correlation with both BTOP50 and SG trend-following CTAs indices from 2000s using the half-life of 4 months for the trend smoothing. 6. Using the trend system parametrized by the half-life of the trend smoothing, I analyze at which frequency of returns measurement the trend-following strategy can generate the positive convexity. 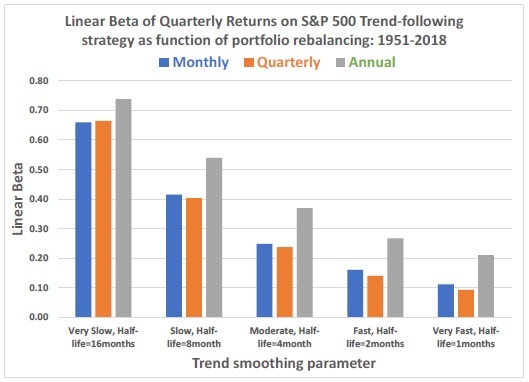 The key finding is that the trend-following system can generate the positive convexity when the return measurement period exceeds the half-life of the trend smoothing and the period of portfolio rebalancing. I recommend the following. - If a trend-following strategy is sought as a tail risk hedge with a short-time horizon of about a quarter, allocators should seek for trend-followers with relatively fast smoothing of signals with the average half-life less than a quarter. 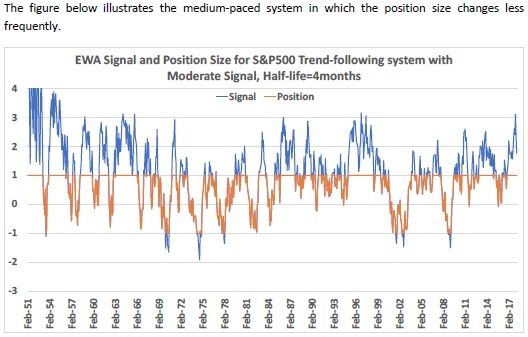 - If a trend-following strategy is sought as an alpha strategy with a longer-time horizon, allocators should seek for trend-followers with medium to low smoothing of signals with the average half-life between a quarter and a year. An alternative way to interpret the speed of the trend smoothing is to analyze the trend-following strategy beta to the underlying asset. For the slow-moving smoothing, the strategy maintains the long exposure to the up-trending asset with infrequent rebalancing. As a result, the higher is the half-life of the trend smoothing, the higher is the beta exposure to the index. Thus, while fast-paced trend-followers can provide better protection during sharp short-lived reversals, they suffer in periods of choppy markets. There is an interesting article on Bloomberg that some of fast-paced trend-following CTAs fared much better than slower-paced CTAs during the reversal in February 2018. 7. I examine the dependence between returns on the trend-following CTAs and on the market-neutral stock momentum. I show that the trend-followers have a stronger exposure to the autocorrelation factor and a smaller exposure of higher-order eigen portfolios. 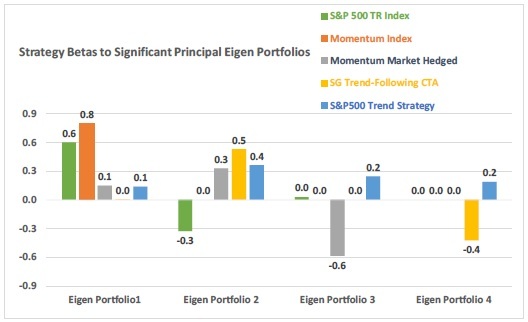 As a result, the trend-following CTAs produce the positive convexity while stock momentum strategies generate the negative convexity of their returns. 8. The allocation to trend-following CTAs within a portfolio of alternatives can significantly improve the risk-profile of the portfolio. 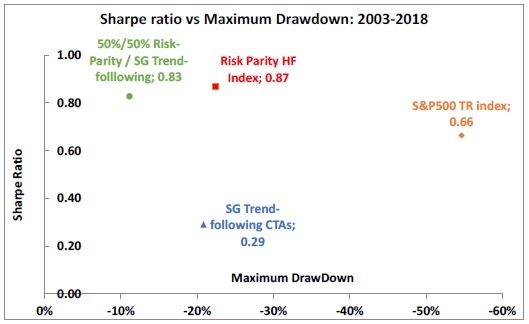 In the example using HFR Risk-parity funds and SG trend-following CTAs index, the 50/50 portfolio equally allocated to Risk-parity funds and trend-following CTAs produces the drawdown twice smaller than the portfolio fully allocated to Risk-parity funds. The 50% reduction in the tail risk is possible because the occurrence of the drawdowns of Risk-parity HFs and Trend-following CTAs are independent. While trend-followers tend to have lower Sharpe ratios than Risk-parity funds, trend-followers serve as robust diversifiers with 50/50 portfolio producing the same Sharpe ratio but with twice smaller drawdown risk. Why Is Allocation to Trend-Following Strategy So Low?